A few weekends ago, the hubby, some friends and I took field trip to Nevada's oldest Winery, the Pahrump Valley Winery, established in 1990. 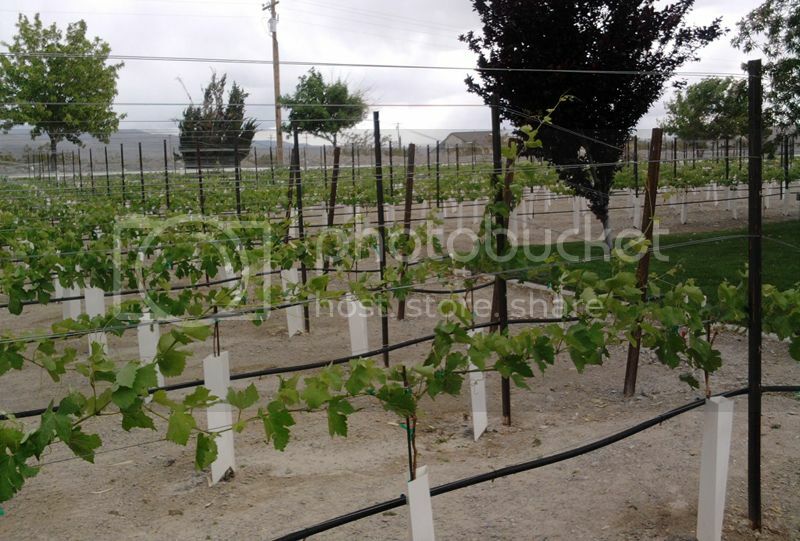 There are three major obstacles to the growth of the wine industry in Nevada. 1) As the UNR experimental vineyard has shown, the climate and soil are excellent for killing several popular varietals dead. Despite these obstacles, the NV State Department of Agriculture really is interested in trying to get more farmers to grow grapes because they consume less water than hay or alfalfa and the long term return on investment is greater. 2) The law. NRS 597.240 states that only counties with populations of 100,000 or less may operate a commercial wine making facility. For about 15 years, PVW was something of a joke. The wine, made 100% with grapes and juice imported from California was eh at best and bleargh! at worst. Thus, hers is the joke that PVW is "The Best California Winery in Nevada." Alas, PVW was out of all wine made with NV grown grapes. Not surprising since they only produce a few cases, given the tiny supply. 2005 Syrah (Paso Robles) -- I got to taste this at UNLVino and was really happy to see that PVW had bottles of it still in stock. Dark, a very fragrant nose, full of the classic blue-black flavors, smooth and lush, and the finish wasn't peppery, but tasted like mocha. 2008 Riesling (Bishop, CA) -- These grapes were grown on the east side of the Sierra in the (rain) shadow of the "Fourteeners" of the High Sierra, not a traditional region at all. Pale gold, floral nose, it's a semi-sweet mouth full of peaches and oranges, with a very long green apple finish. Burgundy -- Off-dry. This wine is "burgundy" only in the sense of the color. The nose is grapey. The color is medium red. The taste is sweet-tart cherries, the body is Pinot Noir light, and it's best served slightly chilled. It's aged in steel, but there are just enough tannins to give a backbone so it's not cloying. It's a really nice back yard BBQ wine. Under the previous owners, the Zinfandel vines out front were purely for decorative purposes. 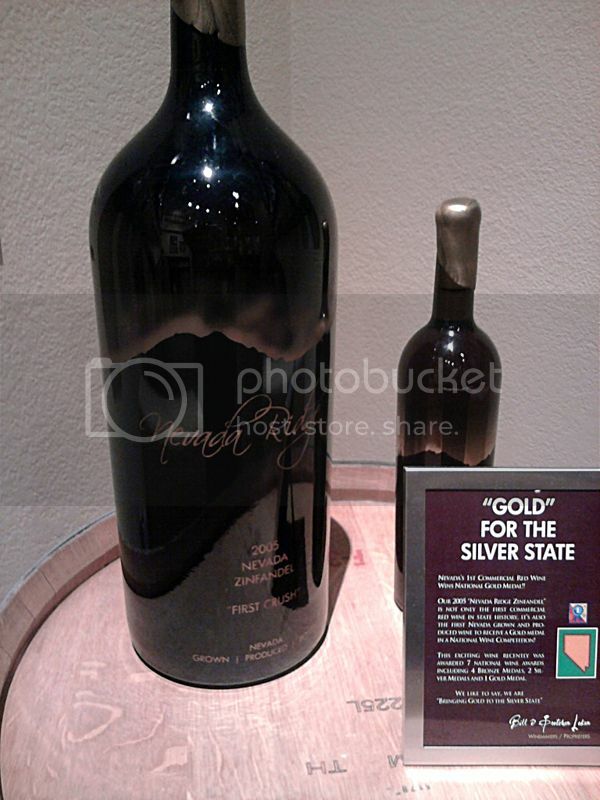 In 2005, the Lokens harvested them and made into the first commercial red wine grown from Nevada grapes. And, having been lucky enough to have tasted it at UNLVino, it was some damn good wine. But don't just take my word for it. It won a gold medal at the Pacific Rim international competition. 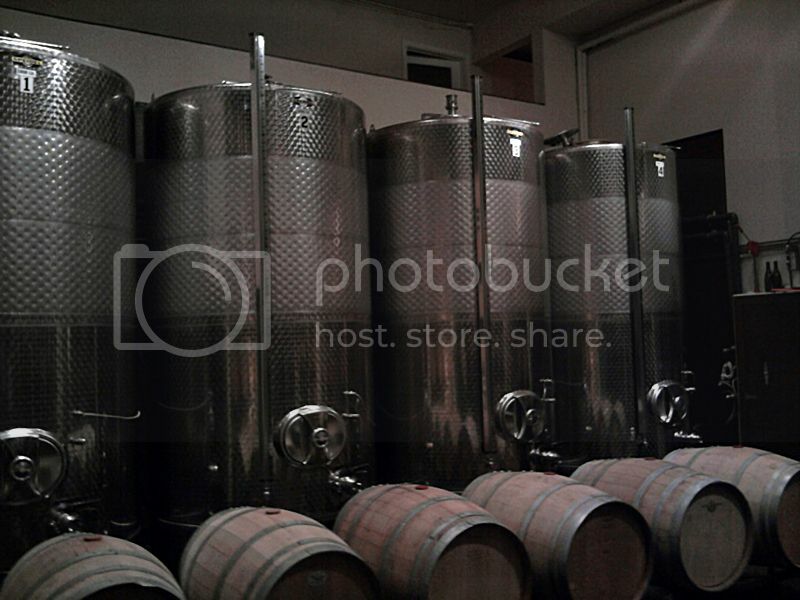 PVW is a boutique operation -- these pictures show almost all the wine in the building. 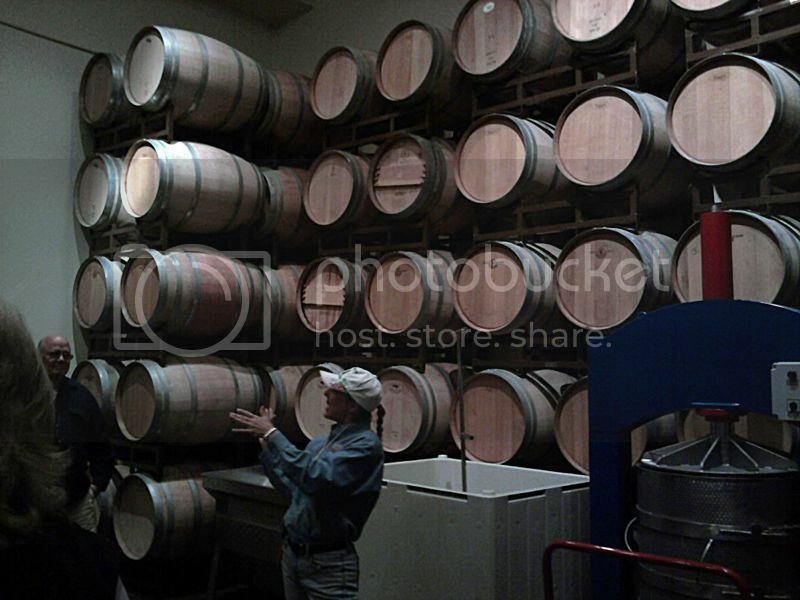 Since the Lokens have taken over, they've started aging wines in a mixture of French and American oak. 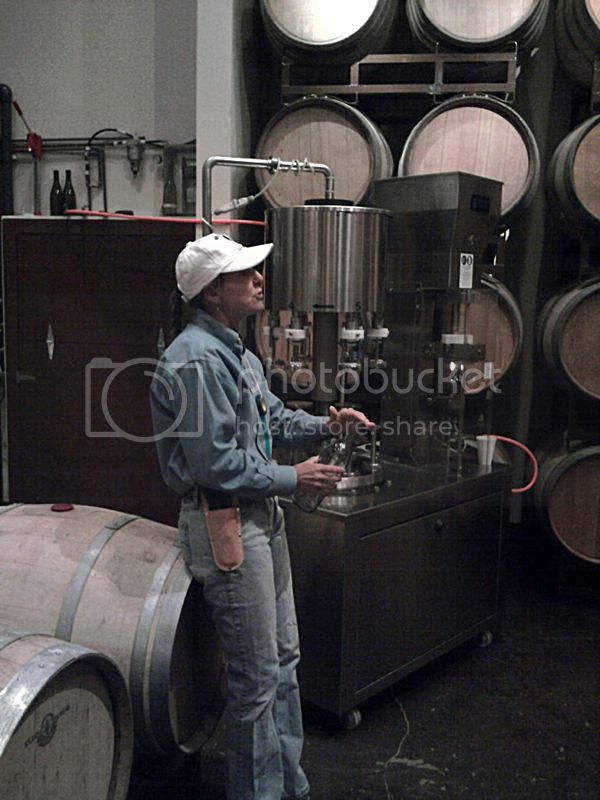 This is Gretchen with the one bottling machine they have. I think these are Zin or Syrah grapes. The climate being so hot and sunny in southern NV, they plant the rows only 5 feet apart so that the mature vines can shade each other. This year's Zinfandel crop, already on the vine. 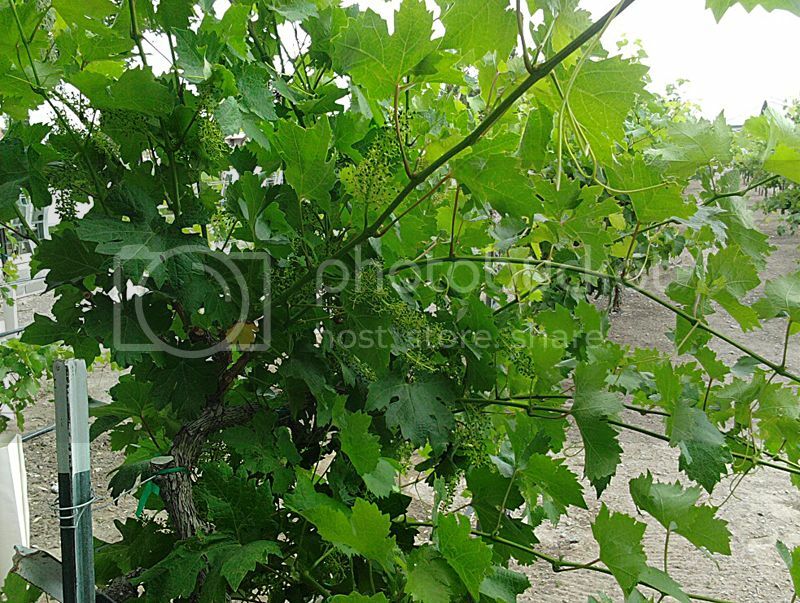 In addition to planting the vines closer together than in most vineyards, they train them with somewhat bushy tops so the heat of the summer sun doesn't turn the grapes into raisins on the vine. Thanks for posting this! I didn't know about this vineyard and now I'll be sure to check them out.